Hair: Golden blond, slightly wavy, hanging to just below the shoulders. Lifemate: Technically none, though he had a special bond with Timmain. 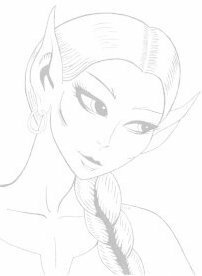 Life history: Adya has the dubious honour of being the very first elf who was killed by humans, though he was by no means the last. He was a Firstcomer and member of the Circle of Nine, the ones who piloted the High Ones' spaceship. Adya's task was to be their eyes, to choose where the ship would go next. He was always looking ahead, always curious, and it was this that made him the first to offer his hand to the humans, only to be brutally murdered. Adya was very close to Timmain, and it was his loss that caused her to first howl out her grief like the wolves.